Following news that KISS members Paul Stanley and Gene Simmons recently announced their co-involvement in the Rock & Brews restaurant chain, the pair co-hosted the March 22 weekend opening of the company’s first international location in San Jose del Cabo, Mexico. Video of the rockers being interviewed at the launch by Cabovision has surfaced. 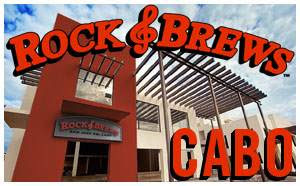 Rock & Brews Los Cabos is the second location for the new entertainment and rock-themed dining concept. Stanley and Simmons, along with Rock & Brews co-founding partners restaurateur-hotelier Michael Zislis and veteran concert promoter Dave Furano, teamed up with Los Cabos’ restaurateurs Jessica Moreira, Rodrigo Cabeza De Vaca, and Sergio Martinez, and developers Alfredo Gadsden, Gabriel Gadsden and Mario Gadsden for the opening. The new Rock & Brews Los Cabos features a unique concert themed-atmosphere complete with hand-painted murals of rock artists, album and tour art. Guests can take advantage of the al fresco dining offered, or enjoy sitting indoors in an authentically themed backstage concert site. The restaurant features a full bar and will have the largest selection of craft beers in Los Cabos. It is set to be a main late-night attraction for locals and tourists alike, as after the dinner rush, a DJ will be spinning tunes nightly. As for music, KISS will continue their “Monster” tour with European dates starting June 1 in Stockholm, Sweden.